Focalyx is a revolutionary and minimally invasive approach where patients receive the most precise assessments and treatment for prostate cancer that allows for preservation of erectile and ejaculatory function, improves urinary function and provides cancer control. [Focalyx] opens the doors to targeted therapies aiming at cancer destruction while sparing healthy tissue and its function, and is applicable to 80% of men with newly diagnosed prostate cancers. An office based approach – Focalyx Dx, Bx, Tx - is gaining advocates among patients at Urology Specialist Group for its ability to significantly improve the quality of life for those suffering from prostate cancer. Developed by Dr. Fernando Bianco and his team, the treatment is virtually painless, requires no hospitalization and is the safest approach possible as risk of infections is 100 times less than one associated with standard techniques. Focalyx provides a much needed option for the management of prostate as data from randomized clinical trials has pointed to a limited benefit at yet greater risk of being harmed by opting for radical surgery – robotic or open and/or radiation therapy. Patient regret is experienced by ¼ men managed with surgery or radiation and for this reason has made active surveillance for prostate cancer a more sought-after option. However, surveillance is based on the premise of not having precision on the exact location of these prostate tumors. The technology used by Focalyx overcomes this caveat and uses a specialized MRI technique that has the capacity to detect 90% of tumors and helps in the exclusion of non-life-threatening lesions. The Focalyx plans, derived from multiparametric MR imaging, represent the backbone to design a GPS-like system for the biopsy, and if necessary, treatment. This precision also opens the doors to targeted therapies aiming at cancer destruction while sparing healthy tissue and its function, and is applicable to 80% of men with newly diagnosed prostate cancers. “We came up with a method that allows us to have a ‘GPS’ of the prostate gland and sample only suspicious areas. We sample those areas through an approach that prevents infection and bleeding, that is pre-planned and precise. We then analyze that information, and for those who have cancer, we know exactly where those cancers are unlike the traditional approach. We then use algorithms we developed to treat only the area with cancer and preserve surroundings areas,” explained Dr. Bianco, an outcomes research scholar who currently leads the Urological Research Network in Miami. In addition to prostate cancer, Focalyx treats coexisting conditions such as chronic prostatitis, benign prostatic hyperplasia (BPH) and patients may experience a substantial objective improvement in urinary flow. 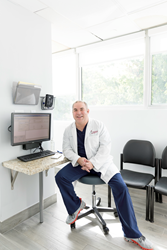 Fernando J. Bianco, MD is a clinical member of Urology Specialist Group and Lyx Health in South Florida. He serves as Investigator In-Chief for the Urological Research Network Corp (URN) in Miami and is a former Professor of Urology at George Washington University (Washington DC), Columbia University (New York, NY) and currently serves as Professor of Urology for Nova Southeastern University.